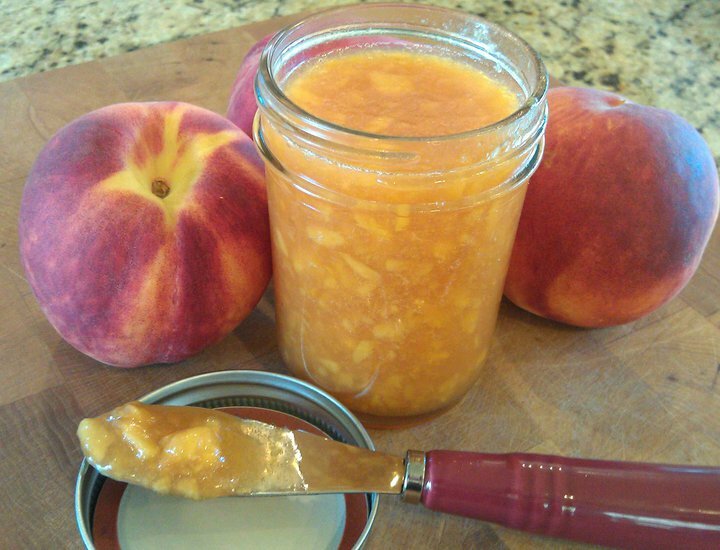 This honey-sweetened all-peach freezer jam is a delicious way to enjoy the fresh, sweet flavors of summer anytime of year! Not only is it great on top of a hot-outta-the-oven biscuit, but you can also use it to make your own homemade fruit-on-the-bottom peach yogurt, and as the base for a delicious barbecue glaze for Sweet-n-Spicy Grilled Chicken. Peaches won’t be in season much longer, so why not store-up some delicious peach flavor to last you all year long! All it takes is a few simple ingredients and a little bit of time to create your own homemade all-fruit preserves. Measure out 4 cups of mashed peaches and place into a saucepan. (Save any leftover mashed peaches for adding as a topping to yogurt, oatmeal, ice cream, etc.) Add lemon juice, vanilla extract and 4 tsp of calcium water (see *note below). Stir well to combine. Next, in a small bowl, combine 3/4 cup of honey with 2 1/2 tsp of Pomona's pectin powder and stir well to thoroughly combine. Set aside. Heat saucepan containing peach mixture over medium-high heat, bringing the mixture to a full boil, while stirring frequently. Boil for one minute while continuing to stir frequently. Then, slowly drizzle in the honey-pectin mixture, stirring vigorously for 1-2 minutes to combine, making sure the mixture returns to a boil and then remove from heat. Use a ladle to divide the jam among five 8-ounce canning jars, leaving at least 1/4 inch of space between the top of the jam and the top of the jar (this space allows the jam to expand as it freezes). *Pomona's Universal Pectin is a wonderful no-sugar pectin that makes thick jam and jelly with full, rich flavor without the use of sugar. It's jelling power is activated by calcium, not by sugar. The calcium powder is included in the box along with the pectin powder. To get started making jam, you'll first need to follow the directions on the package to make calcium water. It's super easy (just mix the calcium powder with water). It can be stored in your frig for several months, allowing you to make many different kinds of homemade jam. Once you have the calcium water prepared, you're ready to make homemade peach preserves (as well as other delicious all-fruit spreads)! With your box of Pomona's pectin, you'll receive a little packet full of jam recipes. Personally, I've found that a few of the recipes call for too much pectin, which makes the jam really jell-up. Since I prefer my jam to be a bit looser, not so jelly-like, I use less pectin. The set also depends on the type of fruit, as well as the volume of fruit used and how chunky or smooth your fruit puree is. So I recommend making a half-batch of a recipe and see how it sets-up and if you like the set. Then you can go from there adding less or more pectin. Happy jam making! 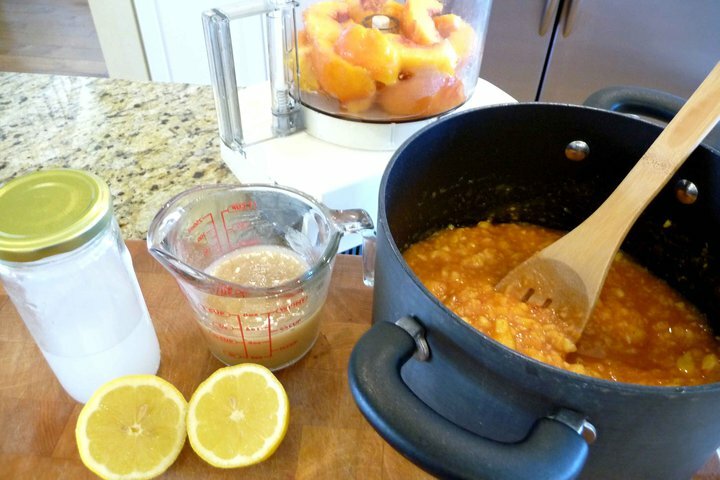 ** A quick and easy way to peel peaches: Bring a stockpot of water to a rolling boil. Add whole peaches and cook for one minute. Remove peaches from boiling water, using tongs, and place in a cold water bath. Once cooled to touch, peel off skins. Hi can you use frozen peaches for this ?? Thanks , I’ve loved all the recipes I’ve made from your site! Keep me coming! Thank you, thank you, thank you! I have been looking for a non-white sugar jam recipe and this was perfect. I used the Pomona’s Pectin which worked very easily and quickly. Yummy raspberry and BlackBerry jam in the freezer. Are there any jam recipes using gelatin? trying to get more great lakes gelatin in our diets and wondering what the difference in outcome is. Gelatin vs pectin. Can you double or triple this recipe or will the pectin have issues setting? Thanks! Thank you so much for such a thorough and prompt response! I think I’m going to attempt to double the recipe with Pomona’s since I have a large enough canner and other stockpots and a strong enough oven to handle this. I’ll let you know how it goes! This turned out perfectly! I doubled the batch and got 12 half pints of jam that jelled just beautifully. I also did Pomona’s recipe for maple vanilla peach jam and doubled that as well and it turned out beautifully with 11 half pints of jam. Thank you for your advice! Made this recipe when you first posted it (and every summer thereafter) and have always doubled the ingredients but kept cooking time listed for single recipe; great results each time. Thank you for another nourishing, delicious recipe! Hi Kelly–Can I follow this recipe and process this in a canner instead of freezing? I do not have any of the Pomonas Universal Pectin (it wasn’t at the store when I went), but I do have Ball RealFruit Low or No-Sugar Needed Pectin. Would that work in this recipe??? Yes, that should work just fine! 🙂 enjoy!